Like most game masters, I have a backlog of games that I’d love to have time to run. I’m not sure if I will actually manage to get around to all of them, but I should get a chance to run one once my current Dungeons & Dragons game wraps up (likely in a few months). Taking inspiration from Diablo, this game would be a hack on the AGE system at the core of the Dragon Age RPG. I’d likely try out some ideas for mixing the idea of powers into the AGE system by making more involved class-background hybrids that can gain class-specific stunts. I could even see trying out class abilities based on the spell mechanics to emulate the computer game’s abilities that use mana for non-spellcasting classes. Players could take the role of a Vizjerai sorcerer, a paladin from Westmarch, or any other character type from the computer games and would face the demonic creatures invading the world of Sanctuary. I’m not sure how closely I’d follow the plot of any game in the series, but the campaign would likely start near the city of Tristram as the corrupting influence of Diablo spreads throughout Khanduras. With the Supreme Chancellor revealed as a Sith Lord and traitor, the already strained Galactic Republic shatters. The Jedi Order, greatly weakened by the betrayal of the clone armies, withdraws from the battlefield and the Clone Wars grind to a stalemate. Despite Master Yoda’s desire to focus on establishing peace between the various factions of the galaxy, a group of Jedi following young Anakin Skywalker launch a crusade throughout the outer rim searching for Palpatine that threatens to reignite the flames of war. This campaign would take place in an alternate version of the Star Wars universe where Palpatine failed to establish himself as Emperor and instead left the Galactic Republic shattered and scandalized. Depending on what the players were interested in, the party could end up being anything from a group of Jedi crusaders hunting Sith on the fringes of civilization or a crew of smugglers dealing with the volatile political climate as they move goods between systems controlled by any number of factions vying for control of the galaxy. I’ve mentioned before that the Bastion of Broken Souls is my favorite “epic” adventure for D&D, and I’d like to take a shot at converting it to D&D 4E. I have yet to run anything in the epic tier, so I’d be using the adventure as a fun way to try out that part of the game. I’d probably also use the opportunity to try out some other tweaks to 4E like my idea for alignment aspects. I picked up a copy of the newest versions of the BattleTech books a while ago and have wanted to run a campaign with them. The 4th Succession War is one of my favorite parts of the BattleTech timeline (likely because I really enjoyed the Warrior trilogy of books). The war seems particularly well suited for getting back into the game after years of not playing since it uses the most basic tech level, but still offers opportunities to sprinkle in some higher-tech Star League relics and prototype technologies. The players would likely form a small mercenary company stationed somewhere near the center of the Inner Sphere and working for either half of the newly forged Federated Commonwealth. That setup could allow them to be deployed against any of the other three Great Houses or be forced to contend with ComStar units trying to disrupt the Davion and Steiner war efforts. Same here. I’m enjoying the D&D I’m running, but I’d like to run some games of the other stuff I have. Call of Cthulhu: I don’t actually love the system or the setting all that much, but I love the idea (nowadays, not so much when I was just starting) of a game the PCs are doomed to lose. Traveller: Another system I looked askance at in my early RPG days, as it was known for being deadly to characters. It can be, but I prefer to think of it as encouraging circumspection and cleverness, rather than violent action. I have the seeds of a setting and even a mission, though the game has enough random tables that one could probably wing it pretty easily. Spirit of the Century: This is meant to be a short game you run when you don’t have time for other games or when people or late or can’t make it, which doesn’t really fit the mold of my group, which gets together to play D&D or not at all. I really like the Fate Point mechanic, and the easy way in which players can take narrative control. West End Games Star Wars: I tend to prefer the Jedi-light era of the game, which is what this game seems to handle best. It’s very rules-light, especially in combat. I don’t tend to be as huge a Star Wars fan as I once was, but I think this could be some light fun, if I can get people to play it. There are also some lesser-known “indie” games I want to try, such as Lady Blackbird. We’re just coming up to the end of an arc in our D&D game and we’re going to take a break to play a few months worth of one shots of different games. 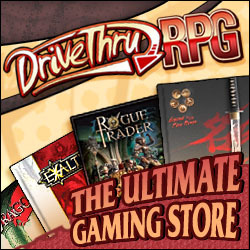 Definites on the list are Mouse Guard, Ghostbusters and the WoD quickstart from the recent Free RPG Day. We’ll probably also play some Traveller (I have another group that I run traveller for but this group hasn’t played) and Dragon Age if I get my way. I would love to play a FATE based game just to see what the fuss is about (I also like the Dresden Files setting). By the time we finish a few games of those I suspect we’ll be chomping at the bit to get back to our D&D campaign (especially after everyone has had some time to mull over the seeds I’ll be planting of what is to come for a couple of months).